I am so happy that I swapped the drapes in the living room. The room just seems so light and bright now. I really enjoyed the camel and gray for winter, but now with Spring on the doorsteps, I needed a change. Pillows in shades of camel, gold, cream and brown. Up close you can see the pretty print on these pillows. The camel solid one came from Goodwill. Be sure to look for pillows there and definitely look for the feather inserts so you can swap out the poly ones on your other pillows for feather. This big window in the dining area gets full sun and really brightens up the entire space. These colors just make the room feel like sunshine, so light and bright. So are you creating sunshine in your home? 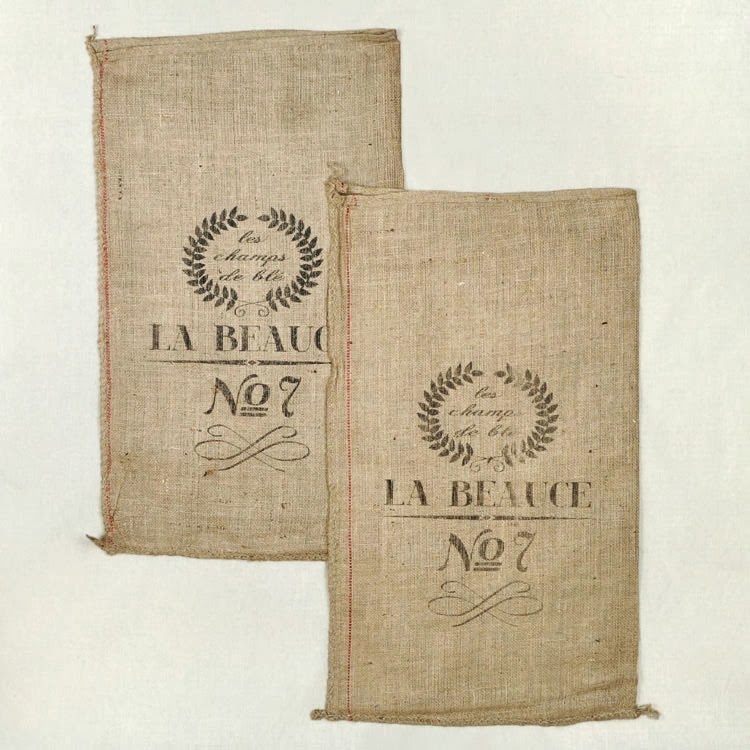 Don't forget to sign up for my French Grain Sack Giveaway. Gorgeous refreshing for Spring Living Room, dear friend!!! The camel print pillow is exquisite, indeed!!! I love your arrangement of white tulips on the coffee table! I agree, sometimes. . .we just have to make an adjustment in the color palette! Marty, the lightened up look is great. 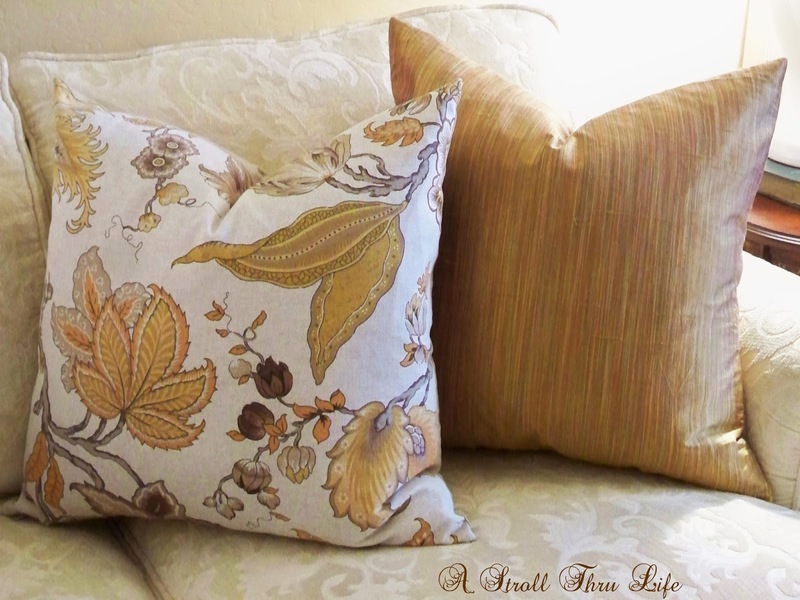 Your Goodwill pillow is a really nice find and looks perfect! Nice and bright for sure, Spring is coming......YEAH! :-) Thanks for sharing, have a great week. So pretty Marty! 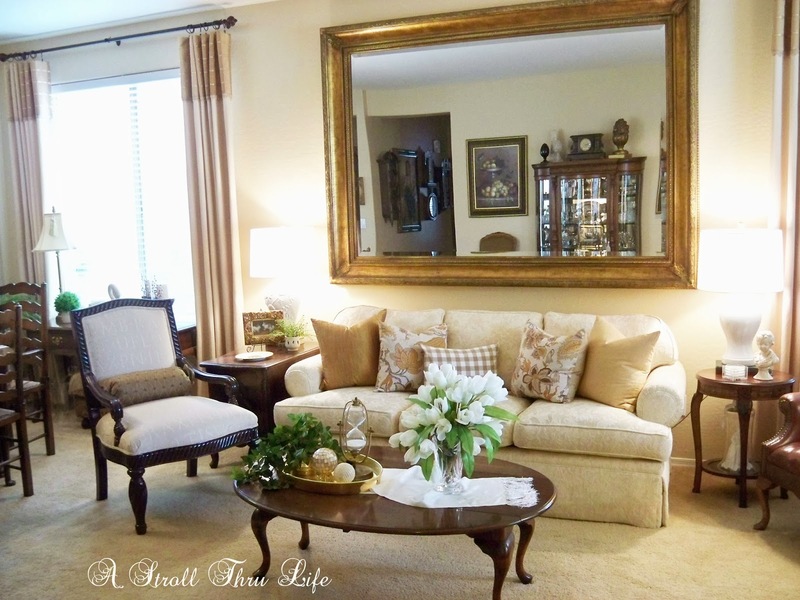 Love that huge mirror over the sofa...I am sure it reflects the light around your living room beautifully! The pillow from Goodwill is gorgeous and is the perfect compliment to the other pillows on the sofa. Yes you are definitely ready for SPRING! Marty I love your living room and I love that you dare to be you! That is, you have your own beautiful style that is timeless and not trendy. Always a pleasure to visit your blog. Your room looks so bright and fresh! Spring has begun I can tell! The tulips look wonderful on the coffee table. Very pretty. I'm all about making rooms lighter and brighter. Marty, Changing the curtains made so much difference to the room. I like it now. Very pretty Marty. Your living room looks so bright and comfy. Very inviting. Love all the pillows and you are right changing up the curtains made a big impact. 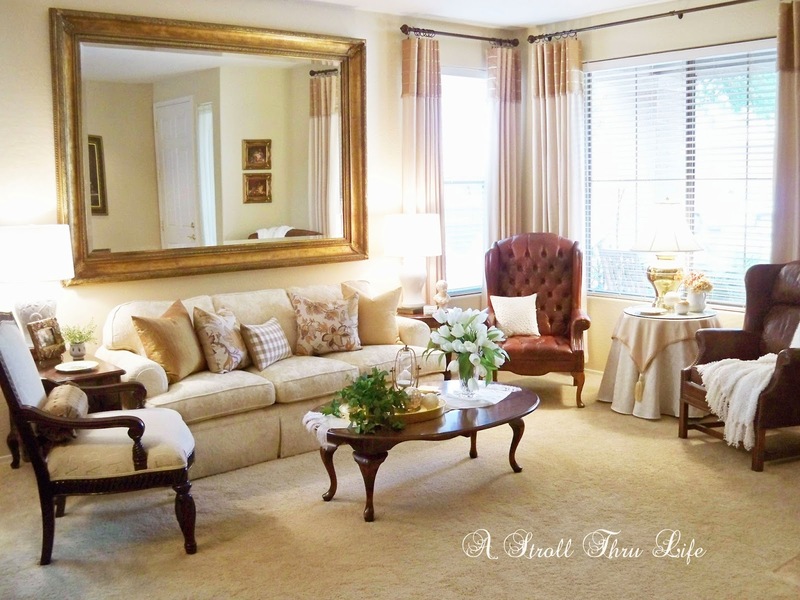 I love the Spring look to your living room. Everything looks so bright and sunny and I love your mirror too. What a great find at GW on the pillows. A few years back I purchased some down pillows for the different rooms and I make my own covers and then change them out with the seasons. Home Goods always has great pillow at a very reasonable price. Very pretty, Marty! I especially love the floral print pillows you used. Great tip about swapping out the poly with the feather inserts! Your home always looks stunning! Lookin good Marty. I'm holding onto two golden framed art pieces that have angels in them, for you. Now if we can ever just figure a way of getting together! Such a warm and welcoming space. Changing things up really perks up a space. I always enjoy seeing how everyone brings Spring into their homes. 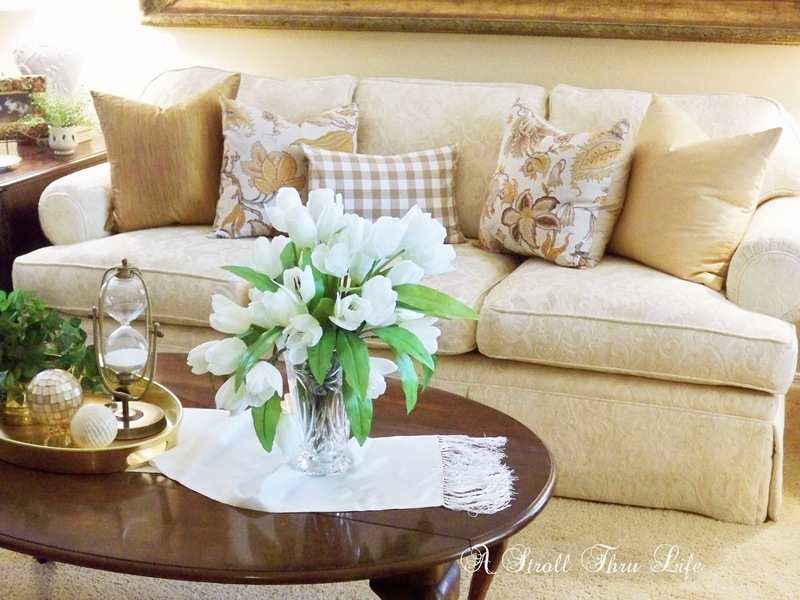 I love that you brought tulips into your Spring decor and photographed your living room in such beautiful light. Thanks so much for sharing with us, Marty! Your simple changes makes all the difference Marty! Love it! I have to start with my spring decorating too! Marty your rooms look gorgeous as always. I love the lighter and brighter look. Hi Marty, love your new bright look! I'm noticing that I admire your decorating so much when I see something in one of your rooms that really speaks to me I find myself out and about the next day looking for the same thing or something similar. Thanks for all your inspiration! Your rooms always are so pretty! I love the way you keep changing it up and making it fresh. Thank you for offering this grainsack giveaway. They are so cool! 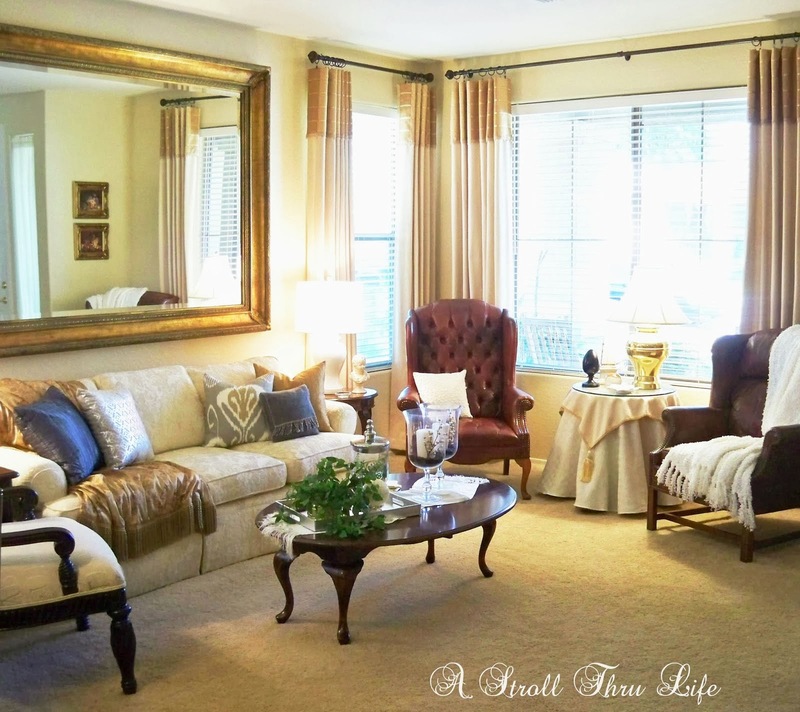 Your living room looks so pretty all lightened up for Spring! 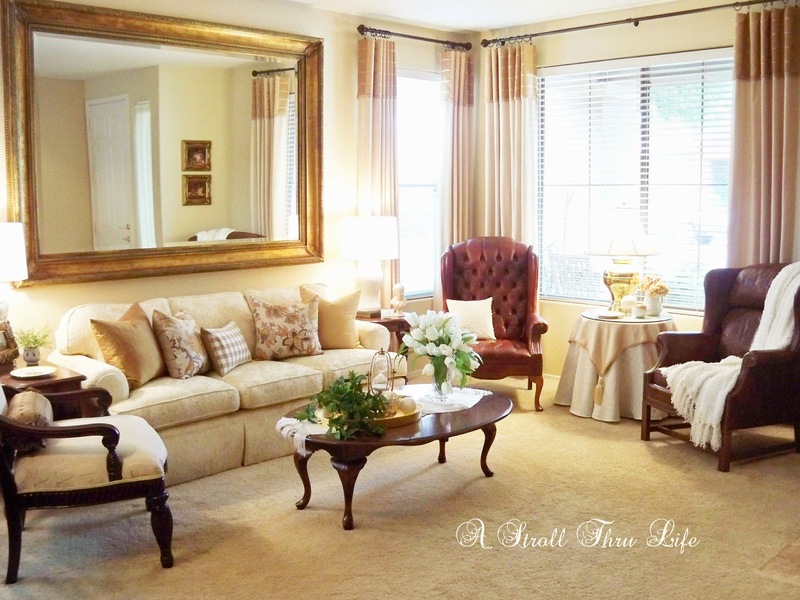 Your living room is truly a beautiful breath of fresh air!!! I just love how you decorate your house, it always looks so great. Could you tell me how to find feather pillows at GW? The only ones I find don't have a zipper and how do you clean them. Thanks for such a great inspiration. 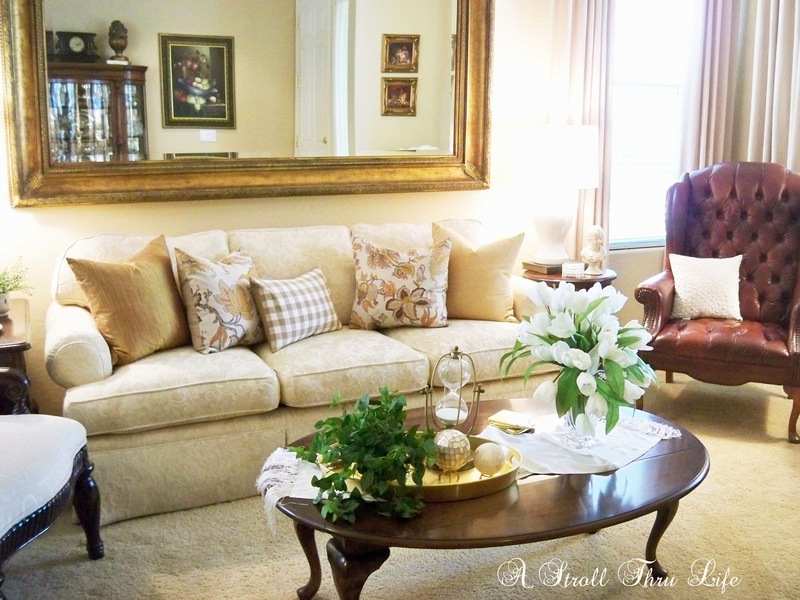 Your living room looks great with your Spring changes. Thanks so much for sharing this Marty. So pretty, Marty just love these Spring changes! Oh so bright and lovely! Oh yes I love my feather inserts! I need to get one to swap out! Feels so fresh and springy! Thanks for sharing on the Thursday Blog Hop! oh my goodness you DO get beautiful sunshine in there! such a gorgeous and soothing room ... absolutely lovely! 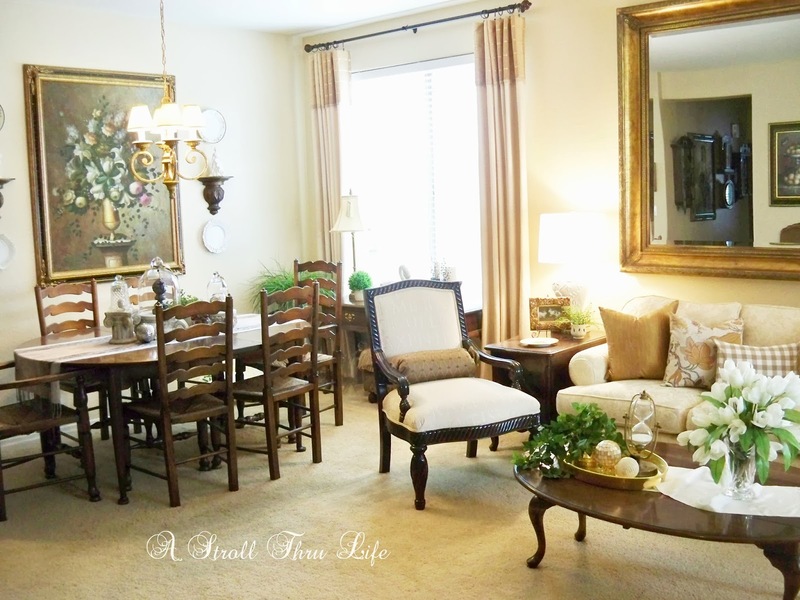 Nice how changing accent items changes the feel of a whole room! Love the sunshine! Thanks for the giveaway!